Trapping is a method of capturing and relocating wildlife pest animals in Genesee and surrounding counties within the state of Michigan. Wildlife biologists recognize trapping as an important wildlife management tool. Trapping is highly regulated and scientifically monitored by professional wildlife companies within each state’s department of wildlife or DNR to ensure that the most humane methods are used and that the population is never endangered. Wildlife management is a complex, scientific discipline concerned with habitat loss, animal damage control, public health and safety, and the responsible treatment of animals. Drivin’ Me Batty’s goal is to apply this science to protect, maintain and restore wildlife populations by maintaining a balance between people and animals. Trapping is a proven method for conserving and managing wildlife resources for Genesee county. Trapping benefits both people and wildlife when it comes to residential or commercial properties. Trapping can help keep urban and suburban residents safe from problems caused by people and wildlife living in close proximity. Wildlife animal trapping is often used in urban and suburban areas to keep overabundant wildlife away from our homes and yards. In most Michigan cities animals such as, coyotes, foxes, and raccoons have entered residential and urban areas as their populations soar and their fear of people decreases. Professional animal trapping assists experts in relocating species to areas where animals can better thrive. Live animal trapping can help restore threatened and endangered species by controlling predators and other animals that would otherwise have killed these sensitive animals or destroyed their habitats. Animal trapping in Genesee County is an involved process that can be time consuming. 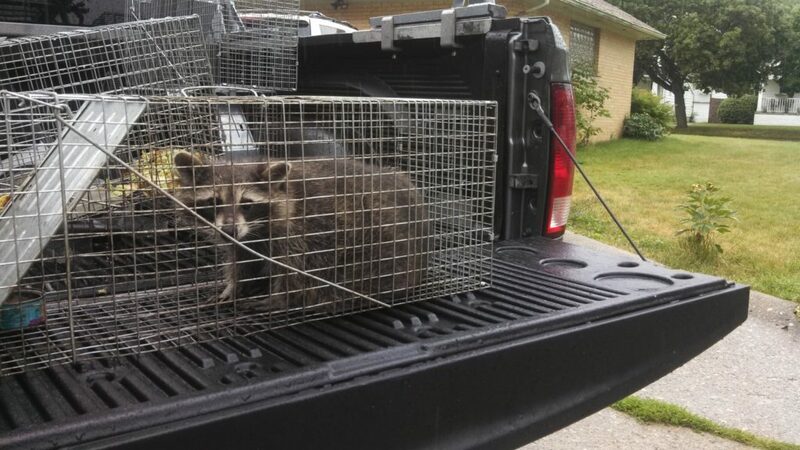 Live pest animal control trapping requires a lot of patience and multiple service trips to your home or business to guarentee the removal of ALL nuisance wildlife animals. We travel throughout Genesee County for our live trapping services to provide quick service for our customers and humane treatment to animal wildlife. Our nuisance wildlife pest animal control services are offered for both residential and commercial properties in Genesee County. Initial Inspection – Setting up a date and time to inspect the property and areas of damage caused by animal wildlife. Our technicians find any entry points or dens where pest animals may be nesting or burrowing. While on site our wildlife technicians determine the appropriate trapping and removal plan to relocate the animals in the quickest safest way possible and gives a written estimate for all services and repairs needed. Trap Set Up – Once the technician has determined the best trapping method for your situation the according traps are set and baited to lure the animals into the live traps for removal. Once the wildlife pest is caught in the trap just call our office to have the animal picked up and relocated. Animal Relocation – Technicians remove the wildlife animal and reset a new live trap if more than one animal is detected. The animals are relocated to the nearest designated wildlife area. Trapped wildlife animals are required to be re-released in the same county they are trapped in to keep down the spread of disease from different species. Animal pests are taken miles away to make sure they can not return to the property. Repair of Damages – After the nuisance wildlife pests are safely removed from the property and relocated we can proceed with any repairs that may be needed if the animals caused any damage to the property. Anything from chimney cap installation to deck barricade screening or even waste removal can be performed only after the animal problem has been taken care of. The technicians at Drivin’ Me Batty have full training in the safest most humane animal trap methods to keep your property and the animals safe from harms way and rid the problem the most efficient way possible. Our Genesee Co. animal removal services provide superior industry standard from squirrel traps to raccoon traps. Let Drivin’ Me Batty take care of all your trapping wildlife removal service needs. We have taken bat control seriously, and have hundreds of satisfied customers across Michigan to prove it.